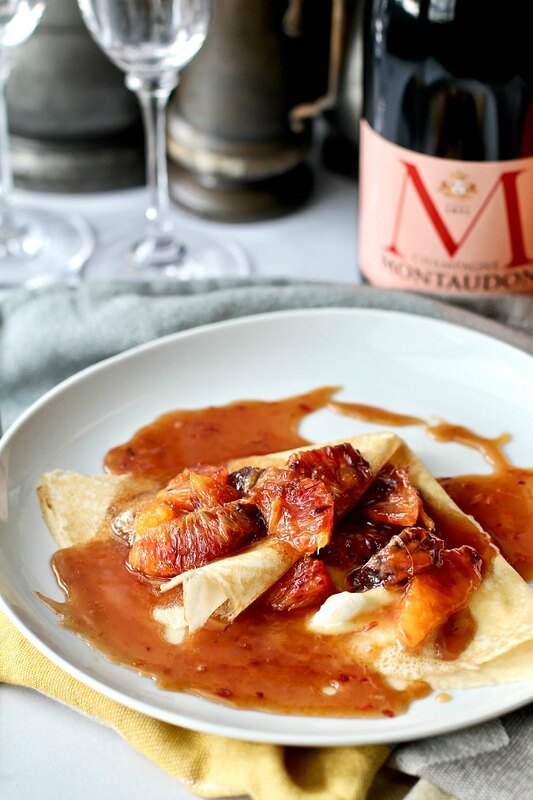 These crêpes are both topped and filled with a delicious Blood Orange Caramel and Mascarpone. I fell in love with these warm crêpes encasing a dollop of mascarpone and topped with blood orange slices and orange caramel sauce. To make the caramel sauce, you heat some maple syrup in a good nonstick pan, add some butter, orange zest, and some fresh orange juice and simmer until it slightly thickens. Next you add some Grand Marnier and cook for another two minutes. Next you add fresh orange segments and swirl them in the pan before spooning them over mascarpone filled crêpes. I made these crêpes on a Sunday morning for a quick brunch. I just happened to have some new blood oranges, some leftover mascarpone, pure maple syrup, store-bought super thin crêpes, and some Grand Marnier just hanging around the house. How often does that happen? To make the caramelized blood oranges and warm the crêpes, I used my new Swiss Diamond 12.5 inch skillet (they are a sponsor of Spring Sweets Week). The pan is pretty amazing. The nonstick coating is actually made with diamonds. Even though this pan is nonstick, you can still brown pork chops like you would with cast iron or stainless steel. 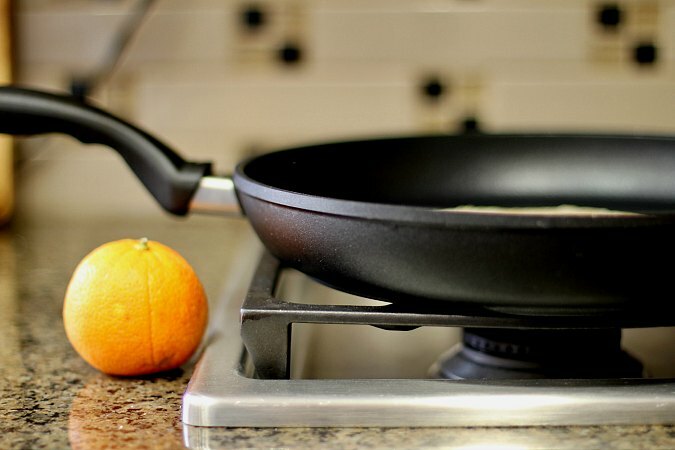 The cooking surface of this pan has a diamond-reinforced nonstick coating. The cooking surface is both durable and PFOA-free, and the handle can withstand oven temperatures of up to 500 degrees F. If you want a beginner set of pans, you absolutely must enter our giveaway below after the recipe. I now have a Swiss Diamond 10.5 inch pan (from another sponsored event) and this 12.5 inch pan. They are the pans I reach for the most. I just need to order some lids and I'm pretty sure my other pans will be totally jealous. You don't need blood oranges to make these orange caramel crêpes. 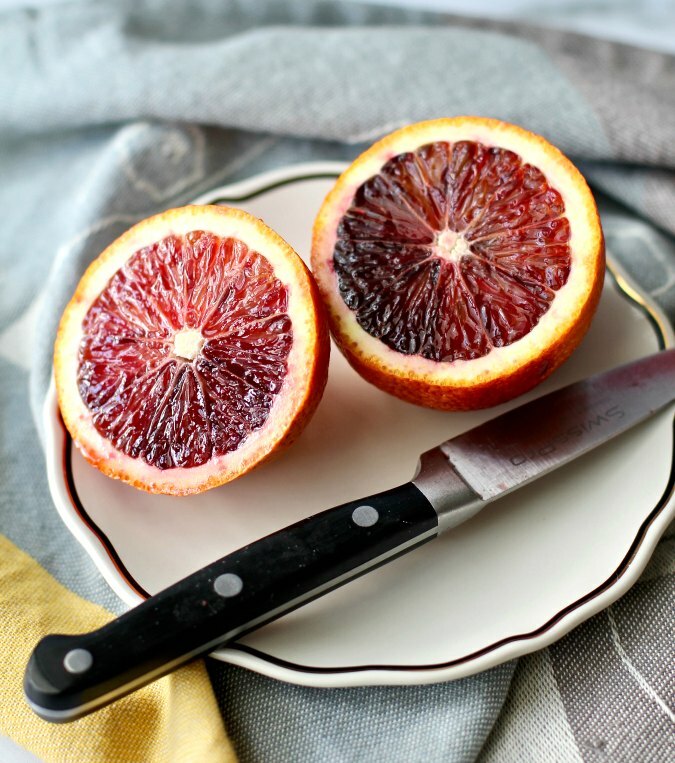 In fact, they would probably be prettier with "regular" oranges, but for the short period when blood oranges are available, you need to buy as many as you can and make lots of delicious salads, desserts, breakfasts, and cocktails with them. I loved them in this Blood Orange, Butter, Lettuce, Radicchio, and Endive Salad. P.S. If you don't have crêpes or don't want to make them, these caramel oranges would be divine over sponge cake, pound cake, shortcake, or vanilla ice cream. This is day three of #SpringSweetsWeek. Over 30 bloggers have gotten together to bring you some wonderful recipes all week long. You can also win some fabulous prizes. Be sure to visit this post to learn more about the prizes. To enter to win, scroll down to after the recipe for the entry form. Zest the oranges and place the zest in a small bowl. Peel the oranges with a small sharp knife. Working over a bowl, cut in between the membranes to separate the orange segments. Place the segments on a small plate and the membranes in the bowl. When you're done separating the orange segments, squeeze the membranes to extract all of the juices and discard the membranes. Pour any residual juices from the plate into the bowl. Heat the maple syrup in a large heavy sauté pan over medium heat. Add the butter, orange zest, and orange juice. Simmer the mixture over medium low for five minutes. Add the Grand Marnier and simmer for two minutes more until the sauce slightly thickens. Place 1 to 2 crêpes on each plate and add a dollop of mascarpone to each. Add the orange segments to the sauce and heat over low to warm the oranges. Spoon the mixture over the crêpes on each plate and serve immediately. What an amazing looking crepe dish. It is so gourmet and looks scrumptious. These crepes sound AMAZING! I love the idea of orange caramel - it sound so easy too! The maple syrup helps a lot. Thanks! My daughter (2 1/2) has recently been obsessed with blood oranges, and who doesn't love caranmel?? These sound like a great breakfast treat! I bet she'd love these! Oh wow do these ever look good! I have never tried making crepes before. The toppings on this are amazing. These are stunning! They sound delicious - I can't wait to try! Wouldn't these be lovely as part of a brunch. Crepes are a favorite around here. I'm going to check your blog for crepe recipes! How awesome does orange caramel sound? I love crepes and would love to try these. I love the flavor profile on this! Looks delish! I'm loving the Swiss Diamond pans! 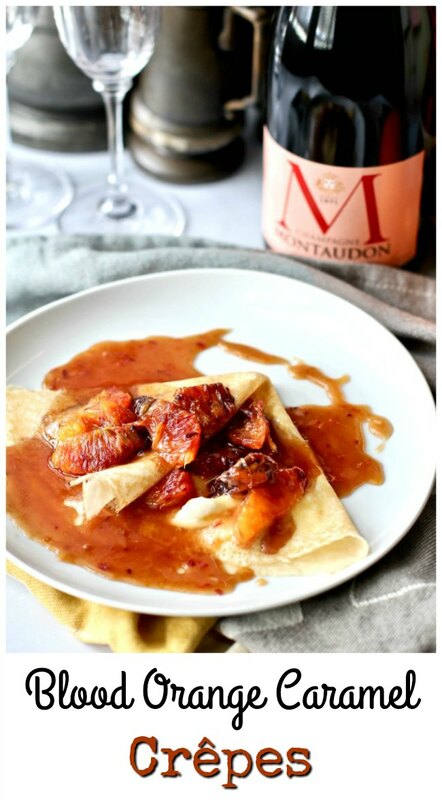 I love these crepes and that blood orange caramel sauce is divine. Wow. These look divine! The blood orange has such a great color and I can just imagine the flavors. So elegant and gourmet looking, I'd be proud to serve these to guests for brunch.